2017 King of Mic Singing Contest | Apply Now! – R&C Media Group, Inc.
R&C Media Group, Inc. > Blog > Events > 2017 King of Mic Singing Contest | Apply Now! Welcome back, everyone! King of Mic singing contest is back and it’s in full force. We’re opening up our contest to singers in LA. Join us in this year’s contest and win an opportunity to go to Guangzhou, China to participate in the finals. 2017 “King of Mic” singing competition strikes again! The event objective is to rebuild the confidence and influence of Cantonese Pop Music and to encourage people to learn more about classic Chinese culture. There are five divisions in total including Guang Dong, Guang Xi, Hai Nan, Hong Kong and Macau in China, plus overseas division. Guang Dong TV America and WCETV/R&C Media Group Inc. are hosts of all the activities in U.S. west. * Valid ID and without any civil or criminal charges. * Participants have to sing in Cantonese or English. * Send a 60 second vocal audio track (without music), together with filled-out registration form to danchen@mail.rc-studios.com before September 25, 2017 to enter first preliminary. The Final singing competition is separated into three categories: fast song, slow song, and self-choice song. Awards will be given to First, Second, and Third place as well as Best Performance, Best Attire, and Best Voice. U.S. West Division best three have a chance to go to Guangzhou to enter TOP 50 Singing Competition. During the competition in Guangzhou, all food, lodging, and travel expenses will be paid by Guangdong TV and contestants will receive professional singing, dancing, and staging training. 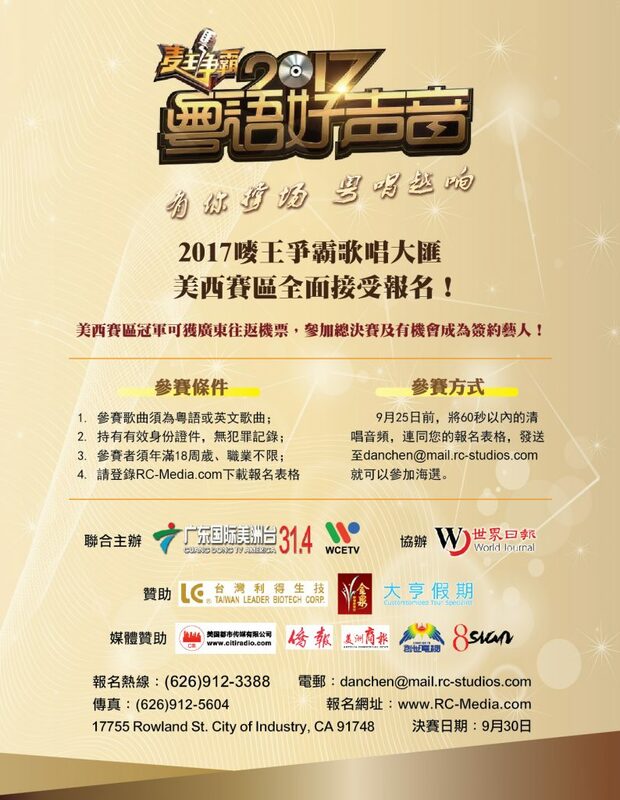 The final winner will receive 500,000 RMB prize and performance contract.